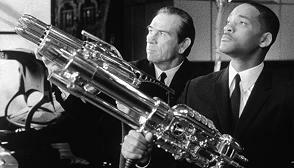 If you haven't seen "Men in Black," rent it, then go see this one. They both offer solid film entertainment. But if time is short, "MIIB" stands on its own, bringing new viewers up to speed with a TV spoof spot: "Mysteries Unsolved." This 3-minute clip hosted by Peter Graves capsules "MIB" in a hyper-cheesy TV re-creation employing swinging flying saucers complete with fish wire. Cut right to the action, Jay (Smith) is the new hot operative in search of a worthy partner. Not easily pleased, he's earned a reputation as the agent most likely to neuralize (erase any alienization memory in) his less than apt comrades. Soon enough, Earth's safety is compromised and a certain retired man in black (Jones) will need to be re-briefed. Of course, there's lots of action, but comedy remains director Sonnenfeld's weapon of choice. Known for his "faster and funnier" attitude, Sonnenfeld keeps the film clipping along. Though low on really big laughs (and hosting only one heartfelt moment) "MIIB" blasts along with fun visuals, a stellar comic beat, strong energy and a never ending string of chuckles and laughs. Tommy Lee performs mightily (as always) cajoling snickers simply by donning postmen's shorts. Smith is also strong, but slips once or twice into his "Ali" voice. Michael Jackson cameos. Sillier, cuter, and shorter than the first (as best I remember), but still a very good time at the cinema, "MIIB" assumes aliens live among us, some good, some bad; while men in black secretly coordinate their immigration and incarceration (when necessary). Tommy Lee says of his comedy, "I don't have a sense of humor of any recognizable kind. I've been very lucky because my mark is often right next to Will's. So, the key to being funny for me is to stand as close to Will Smith as possible and do everything Barry (the director) tells me to do. It appears, on some occasions, I've gotten away with that." I spoke with Knoxville, Sonnenfeld and Warburton earlier this year at their "Big Trouble" junket. Men in Black II (MIIB). Copyright © 2002. Rated PG-13. Starring Tommy Lee Jones, Will Smith, Lara Flynn Boyle, Rip Torn, Johnny Knoxville, Rosario Dawson, Tony Shalhoub, Tee Patrick Warburton, Jack Kehler. Screenplay by Robert Gordon and Barry Fanaro. Produced by Walter F. Parks and Lauri MacDonald at Columbia/AMblin.